Media day has come and gone here in Iowa City, fans are getting excited about the high expectations that Fran McCaffery has set for this year’s team. But how will they stack up against a very competitive Big Ten field? Here’s a breakdown of all 14 teams in the Big Ten for the upcoming season. Coach Tom Izzo has a loaded squad once again this year as Michigan State is looking to make their first trip to the Final Four since 2015. The return of star forward Miles Bridges almost immediately made the Spartans the favorite for the conference title and are considered one of the top 5 teams in the country by many basketball experts. Bridges is aided by veteran players such as Gavin Schilling, Matt McQuaid and Lourawls “Tum Tum” Nairn, Jr. Michigan State also adds 6’10” forward, Jaren Jackson, Jr. A five-star recruit coming out of high school, Jackson looks to make impact right away in East Lansing. Losing Caleb Swanigan to the NBA Draft leaves a huge void for the Boilermakers to fill, but the return of Center Isaac Hass should once again give Purdue a dangerous low-post threat. The Boilermakers do return a slew of guards and forwards such as Carsen Edwards, Dakota Mathias, Vincent Edwards and PJ Thompson from a team that averaged 79.3 points per game a season ago. Matt Painter has another dangerous team in West Lafayette this year, and expect them to be right in thick of the hunt for the Big Ten crown. This one may come as a bit of a surprise, but the Wildcats return their top 5 leading scorers from last year’s team that made the NCAA Tournament for the first time in school history. In his fifth season at the helm, Coach Chris Collins has turned around the once dormant program into one of the better ones in the Big Ten. Senior captain Bryant McIntosh will lead the charge for Northwestern after he led the team in points and assists per game. He will be backed by forwards Vic Law and Scottie Lindsey, with Derek Pardon manning the middle. The stage is set for a possibly historic run for the Wildcats. Coming off their best season in fifth-year coach Richard Pitino’s tenure, the Golden Gophers return much of their squad from last year’s NCAA Tournament team. Senior guard Nate Mason will lead the charge after averaging 15.2 points per game last season, and sophomore sensation Amir Coffee will look to build off a stellar freshman campaign where he averaged 12.2 points and 3.8 rebounds per game. Minnesota did make a splash in their incoming freshman class with the signing of Bronx guard Isaiah Washington, a four-star guard who will look to contribute to an already talented back court. 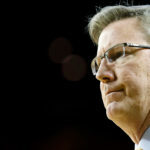 Entering his eighth year at Iowa, Fran McCaffery’s squad has as much potential as anyone in the country. Losing Peter Jok will leave a temporary void to fill offensively, but it looks to be filled by the 1-2 guard combo of Jordan Bohannon and Isaiah Moss. 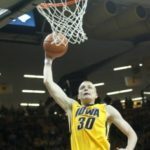 Junior forward Nicholas Baer is the heart and soul of this Iowa squad and is one of the most energetic players in the conference on both ends of the floor. The low-post combo of the explosive Tyler Cook and the fundamentally sound Cordell Pemsl could also be a dangerous duo for the Hawkeyes. Iowa also adds center Luka Garza with their incoming freshman class, a four-star center from Washington D.C., who looks to contribute right away on what looks to be a sleeper team in the Big Ten. 16 years later, and the Badgers will have finally not finished in the top four. Most other years, Greg Gard’s squad would be favorite’s to be in that position, but in a year with so many talented teams, they will fall just short. While the Badgers do lose four of their top five scorers from a year ago, junior forward Ethan Happ looks to blossom into a star for the Badgers. Paired with sophomore guard D’Mitrik Trice, Wisconsin could have one of the more lethal guard-post combos in the conference. Junior guard Khalil Iverson will also provide valuable experience for a rather young Badgers team. As much as people count on Wisconsin to finish in the top four, count on John Beilein to put out a good team in Ann Arbor. The Wolverines will be led by junior forward Moritz Wagner, who could do a little bit of everything last season. Muhammad Ali Abdur-Rahkman and Duncan Robinson look to replace Derrick Walton and Zak Irvin in the front court. Michigan does add Kentucky transfer Charles Matthews to the back court after Matthews was forced sit out last season due to NCAA transfer rules. Beilein has the horses to perhaps make another run at the tournament in 2018. The loss of Melo Trimble at point guard is a big hole for the Terrapins to fill, but Mark Turegon brings in a young talented squad for the ’17-18 season. Sophomore forward Justin Jackson looks to be the center of attention coming off a fantastic freshman year where he averaged 10.5 points and 6.0 rebounds per game. Fellow sophomore guards Kevin Hueter and Anthony Cowan look to fill Trimble’s role together. A player to keep an eye on is junior Ivan Bender, who will play a big role in the post with the graduation of Damonte Dodd. Maryland will have to fight to earn their way into the tournament. Now in year seven under Pat Chambers, the Nittany Lions may finally have the horses to make a return to the NCAA Tournament. Sophomore’s Tony Carr and Lamar Stevens led Penn State in scoring a year ago and look to build on that this year. Senior guard Shep Garner will add some experience to the young lineup, averaging 12 points per game last season. The front court looks to be manned by junior-transfer Satchel Pierce and sophomore Mike Watkins, who are two bigs who run the floor well for the Nittany Lions. Archie Manning enter his first season in Bloomington with a relatively young Indiana team. Miller will be thankful for senior guards Robert Johnson and Josh Newkirk, two of last years top five leading scorers. They will be aided by forwards Juwan Morgan and De’Ron Davis, backups from a year ago who will look to step into the shoes of Thomas Bryant and OG Anunoby. Robert Johnson will have to be star this year if Miller wants to make a statement in his first year and reach the NCAA Tournament. Tim Miles and company have a lot of work to do in Lincoln before they can begin to think about the postseason. Thankfully, Miles can rely on junior guard Glynn Watson, Jr. to do a lot of the scoring after averaging 13 points a game last season. The front court will be manned by the duo center Jordy Tshimanga and Georgetown-transfer Isaac Copeland. Look also for guard Evan Taylor and forward Jack McVeigh to contribute big minutes for the Cornhuskers as well. It’s been nearly five seasons since the Fighting Illini have gone dancing in March, but new head coach Brad Underwood looks to change that trend, although it may take longer than his lone season at Oklahoma State. Sophomore guard Te’Jon Lucas will have to step up right away for Illinois to replace Malcolm Hill. The Illini did make a late splash in recruiting, picking up four-star guard Mark Smith not long after hiring Underwood. Look for the true freshman to contribute valuable minutes and possibly start this season. Chris Holtmann enters his first season in Columbus with a rebuilding project greeting him at the front door. The Buckeyes graduated Marc Loving and lost Derek Funderburk and Trevor Thompson to other reasons. The Buckeyes do have talent, Jae’Sean Tate, C.J. Jackson and Keita Bates-Diop will the lead the charge for Ohio State. But the talent level certainly drops off behind those three, patience will be key in Holtmann’s first couple of seasons. A glimmer of hope in Steve Pikiell’s first season in Piscataway, the Scarlet Knights won eight more games than the previous season and gave some of the higher-ups in the conference all it can handle. Rutgers returns three of their top five scorers from a year ago, including junior guard Corey Sanders, who blossomed into a star for the Scarlett Knights a year ago averaging 12.8 points per game. He will be aided by senior forward Deshawn Freeman and senior guard Mike Williams. This could be a team that leads Rutgers from out of the cellar. NBA Preview: Who will surprise out of the West?